Nikola Corp., which is working to launch production of zero-emission electric semi-trucks, said Wednesday its third round of funding closed $10 million above its $200 million goal. This latest funding effort began in late July and includes a $5 million investment from company partner Nel ASA of Oslo, Norway. Nel was previously awarded a contract from Nikola for the hydrogen production and related fueling equipment it needs to create an infrastructure to support its hydrogen-electric trucks once they hit the roads. The privately held company declined to identify other investors. Its previous round of funding a year ago brought in $44 million, said the company. Nikola, which recently relocated its headquarters to Phoenix from Utah, has announced plans to build three types of hydrogen-electric semi-trucks: Nikola One, a sleeper; Nikola Two, a day cab; and, as announced just this month, the Nikola Tre (that’s three, in Norwegian), a day cab for the European market. In April, the company plans to have a Nikola Two prototype ready to drive at its showcase event in Phoenix. Visitors also will be able to sit in a prototype of the Nikola Tre, said the company. And the company expects to have a hydrogen fueling station up and running onsite, too. “Now that we are funded and oversubscribed, we are kicking it into high gear and preparing for Nikola World 2019,” said Nikola founder and Chief Executive Trevor Milton in a statement. Nikola is racing against several competitors to produce road-worthy electric semi-trucks. In June, the 4-year-old company said it expects to begin fleet testing its trucks in 2019. Tesla Inc. also is working on its all-electric, long-distance Semi truck and has said it will put it into production next year. This summer, Daimler AG said its all-electric Freightliner eCascadia for regional runs will be in production in three years. 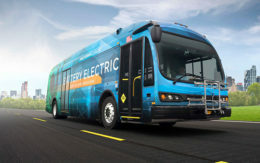 Navistar International, with Traton, formerly Volkswagen Truck & Bus, also has electric truck plans in the works. 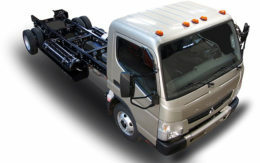 And Toyota Motor Corp. recently announced a second-generation Class 8 fuel cell truck for testing in drayage operations at the ports of Los Angeles and Long Beach in Southern California. The push for electric trucks is driven in large part by the increased demand by regulators for zero-emission or low-emission vehicles. For now, most heavy trucks still run on diesel. Some companies are beginning to take steps to change that. In May, Anheuser-Busch placed an order for up to 800 hydrogen-electric-powered semi-trucks from Nikola. Nikola said the trucks, which will make regional runs between breweries and distribution centers, will enter service in two years. In December 2017, the brewing giant ordered 40 electric semi-trucks from Tesla. Unlike Nikola, Tesla typically requires a deposit and partial payment upfront. The two companies have split the name of inventor and electrical engineer Nikola Tesla, who invented the alternating current electric system still in use today. That didn’t stop Nikola from suing Tesla in May, alleging the company stole its truck design. Tesla has said the suit has no merit. In June, Nikola also said it plans to build the first two hydrogen-fuel stations in Arizona, where it is headquartered, and California. An additional 28 stations are planned on key routes serving Anheuser-Busch breweries and distribution centers. The stations will be able to refuel both Class 8 heavy trucks and consumer cars, according to Nikola. It’s unknown whether the company plans an additional round of financing anytime soon. What are Nikola’s plans for going public?